We celebrated the first warm, springlike day with this risotto and parsley pesto feast. 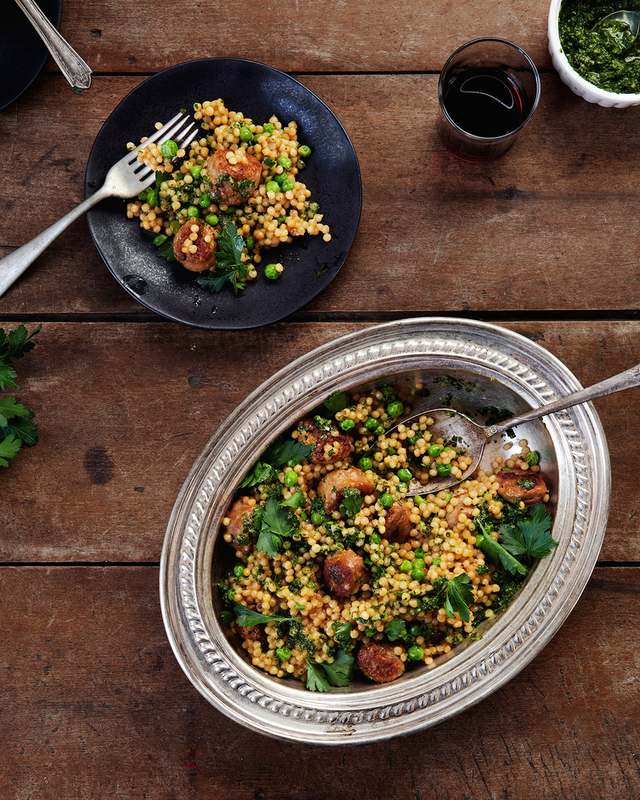 I have a serious love Israeli couscous, and turning it into a risotto is something we'll definitely be doing again and again. For me, this is perfect meal for making that slow transition out of cold weather comfort food, into the bright flavors of spring . 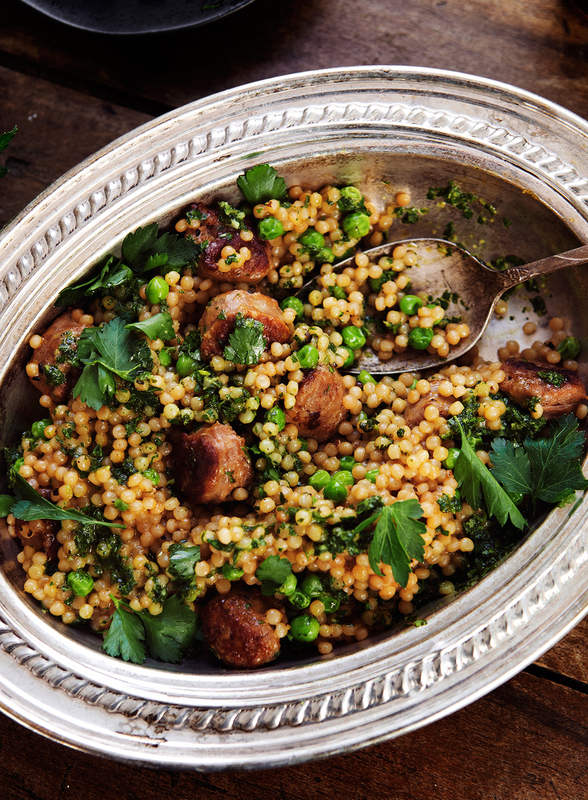 The pesto is really light, and fresh tasting, with the couscous and sausage keep it on the heartier side. In a medium saucepan over low heat, bring chicken broth to a simmer - keep warm. In a small skillet, heat 1 tbs olive oil over medium high heat until shimmering. When hot, add sausage slices and sear, undisturbed for 2 minutes. Flip sausage, cook an additional 2 minutes on opposite side. Reduce heat and cover to cook through, an additional 3 minutes. Remove from heat and set aside. In a separate skillet over medium heat, warm remaining 1 tbs olive oil. When shimmering, toast couscous until lightly browned, about 5 minutes. After couscous is toasted, add 1 ladleful of chicken stock, stirring vigorously. Continue stirring until stock has been absorbed. Add next ladleful of stock and repeat process until all 3 cups have been absorbed (about 8 ladlefuls and 25 minutes). When all stock has been incorporated, add peas and sausage. Stir to combine. Finish with addition of 1 tbs butter and salt and pepper to taste. To serve, top with parsley pesto. In a food processor, combine all ingredients. Pulse till a paste has formed. Use immediately.